People's Republic of China has successfully launched three "taikonauts" into space Tuesday, in its fifth manned space launch since 2003. In its 15-day journey, the spacecraft will dock with the orbiting space lab Tiangong-1 twice, once through automatic operation and the other manual, and a lecture will for the first time be given on board of the assembled orbiter to a group of students on the ground. 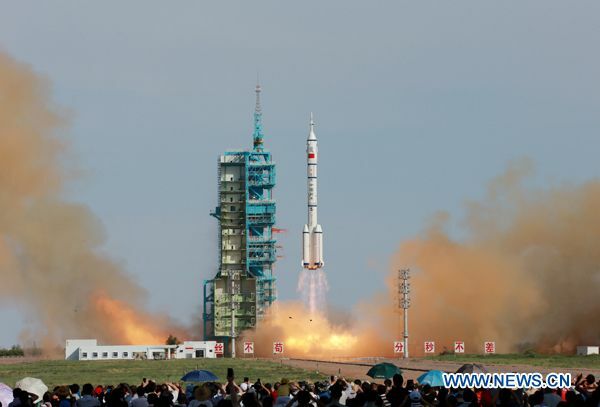 Two men – Nie Haisheng and Zhang Xiaoguang – and one woman, Wang Yaping are aboard the Shenzhou-10 spacecraft, which was launched by a Long March-2F rocket around 5:38 p.m. local time.